Sandy beaches, beautiful sunsets, and relaxing evenings are waiting for you! 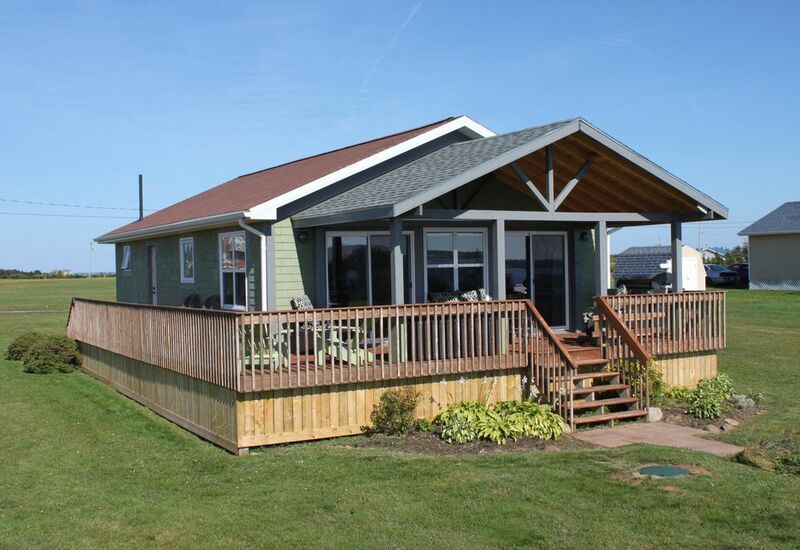 The Dunes is a modern cottage built on a peninsula that stretches along the north shore of PEI between the Gulf of St. Lawrence and the Darnley Basin. It's perfect for couples or families and is ideal for four to six people. The 956 square foot cottage features a knotty pine interior with open vaulted ceilings in the living room, dining room and kitchen. The open living area looks out over a large deck to Darnley Basin through two sliding patio doors. It boasts a modern well-equipped kitchen with top of the line stainless steel appliances, including a ceramic cook-top stove, large french door refrigerator, built-in dishwasher, and microwave oven. Shopping & Services: A convenience store is a half km away at Twin Shores campground. It has a dairy bar, take-out restaurant and coffee shop. The best place for groceries is The Independent in Kensington. It’s open on Sundays. Kent and Castle are the two main hardware stores in Kensington. There are two service stations in Kensington along with a Scotiabank, Credit Union, Car Wash, Bakery, Gift Shops, Government Liquor Store and the Island Stone Pub. Dining Out: Restaurants and tourist attractions can be found in several of the towns along the north shore. The Sou'west in New London and Carr’s Oyster Bar in Stanley Bridge are great waterfront restaurants. Some of the finest dining on the island can be found at The Dalvay near Stanhope and The Olde Mill Restaurant in New Glasgow. When leaving Lower Darnley Road, turn left onto Highway 20 and follow the scenic route to French River, Seaview, Stanley Bridge and New London. It is a beautiful drive along the gulf coast. The Island Stone Pub in Kensington is a must as is the Frosty Treat dairy bar. Ship to Shore restaurant is a local favourite - only 5 minutes away in nearby Malpeque. I've always loved the water - I guess that's no surprise since I was born in a small town on Lake Huron, in Ontario, Canada. My best childhood memories are of time spent at the beach. I've lived in a number of places in Canada, including Alberta, British Columbia, and New Brunswick. While living in Dieppe, NB, I was fortunate enough to visit much of Atlantic Canada. I loved PEI so much that I bought The Dunes as my weekend getaway. Of course, it was simply referred to as "the cottage" at that time. In 2008, a job transfer to Toronto, where I currently live, left me with a decision to make regarding the cottage - keep it or sell it. I knew I just had to keep it and that's when I began renting it to summer guests and it officially became "The Dunes". The idea was to cover the cost of ownership while maintaining a place that I could still visit a couple of times a year. It was the right decision. I looked at several different areas of the island before settling on Darnley Shores - there was something about being away from the main tourist areas that I liked. There was also that great beach on the North Shore that is just a short walk away. It reminded me of summers on Lake Huron. Since I was spending just about every weekend I could at the cottage, I outfitted it with the things that would make me comfortable while I was there. I had stayed at other cottages but they all seemed to be filled with the leftover items that were no longer needed, wanted or being used around peoples' houses - they seemed to be filled with things that were "good enough for the cottage". I wanted my place to literally be like a home away from home. Unlike a lot of rental cottages, you'll find that The Dunes is very well-appointed with finer touches - nicely decorated with quality window coverings and linens, nicer wine glasses, dinnerware and flatware, plenty of small appliances and quality full-size stainless steel appliances. You'll also find great outdoor furniture and an over-sized grill on the deck. I hope that it feels like home for my guests or at least feels like the type of getaway they would put together for themselves. This modern bathroom has a one-piece fiberglass shower and bath tub with a curved shower rod, toilet, sink and vanity cabinet with plenty of storage, ceramic tile floor and a ceiling exhaust fan. Hand and bath soaps as well as a hair dryer, paper products and towels are provided. Local and emergency calls - no long distance service. Electric baseboard heat with individual controls in each room. Spare linens can be found in the closets or in the vanity in the master bedroom. Full-size washer and dryer in a separate laundry room. Laundry detergent and dryer sheets are provided. Full-size electric clothes dryer. Fabric softener sheets are provided. The linen closet is well-stocked with bath, beach and hand towels as well as face clothes. You'll find a yoga mat in the master bedroom closet. The living room has comfortable leather club chairs and a sofa sectional that converts into a large Queen Size bed. Stainless steel dishwasher. Detergent pods are included. Top of the line stainless steel French door refrigerator with two separate bottom freezer drawers. Top of the line stainless steel, 5-burner ceramic cook top range with dual temperature oven compartments. Automatic coffee maker as well as a French press. Paper towels, aluminum foil and plastic wrap are there to be used. There are spices in the spice drawer as well as paper plates, plastic cups and plastic utensils for picnics. Enough dishes and utensils for up to eight people. There are even paper plates and plastic utensils if you're planning a picnic. Full gourmet kitchen with quality stainless steel appliances. From casual to romantic, you will be able to prepare great meals at The Dunes. There is table seating for six plus a breakfast bar for two. Flat screen TVs in the Living Room and Master Bedroom. There is a CD player and a Bluetooth speaker for your music. One in the living room, one in the bedroom. There are a few novels and hardcover books in the second bedroom and the cabinet in the Dining Room. Games and puzzles can be found inside the coffee table. There are a few CDs in the living room if you didn't bring any of your own. There are beach toys in the beach wagon. There are plenty of movies on DVD in case it rains. There is plenty of room on the 2/3 acre lot for outdoor games. The deck is partially covered by a gable end awning. The cottage features a large deck with comfortable outdoor furniture. The cottage is elevated and is accessed by stairs - once inside, the entire cottage and deck are on one level. Rustic barn-style hinges and door hardware add to the charm of the beach house. The kitchen, foyer, bathroom and laundry room have ceramic tile flooring. The bedrooms and open-concept living area have dark barn board laminate flooring. There is a shed where our 'beach wagon' and lobster pot are stored - the beach wagon is stocked with all the essentials for a day at the beach - chairs, toys, beach blanket, cooler, and beach towels. Its balloon tires and large cargo space make walks to the beach easier and much more fun. Pets are not permitted. My husband and I stayed for a week on our recent visit to the island. Eugene was very responsive to everything. The house had everything that was needed/wanted on our visit. Very quiet area that was a nice break. He offered a lot of items that most people would need to pick or pack while staying. I have already given the information to some of my friends that are interested in visiting the island. I hope they look into staying here. They won't regret it for one minute. Thank you again Eugene for allowing us to use your wonderful home. It's so great to read how much my guests enjoy their stay and to learn that the small touches are adding to their vacation experience. I really appreciate the kind words and am humbled by the praise because I can't take all the credit. Every weekend, experienced housekeepers are busy making sure the cottage is clean and has fresh linens before guests arrive. The caretaker knows the property well and keeps me informed of anything that needs attention. In addition, landscapers ensure the lawn is looking its best and is ready for outdoor games. They all play an important part in helping guests enjoy their time at the cottage. I'm so glad Tricia and Ricky enjoyed their stay and I'd be more than happy to welcome them back next year. As well, I would eagerly welcome their friends if they are lucky enough to spend some time on PEI. In keeping with providing a quality rental property and thanks to a power surge that zapped the control panel on the oven this summer, when they return, they'll notice brand new stainless steel appliances that have been ordered for the kitchen. Had a great stay. Well stocked/equipped house, clean, cute comfortable, lovely location. Directions to get there were good, directions regarding everything in the house also good. No complaints, we would recommend to others and would stay there again if/when we go back up. A wonderfully relaxing week - charming cottage in the perfect area for families. We are a family with two young children (aged 2 & 3). This is our 3rd year in PEI, but 1st year at this cottage. This was definitely our favourite year. The property itself is large, with lots of flat grassy space to play, fly a kite or run around. The cottage is definitely nicer than the pictures suggest - it is very clean, nicely decorated and comfortable. It does not feel like a rental - the thoughtful maintenance and oversight of the property is clear as it feels well loved welcoming. The kitchen definitely has everything that could ever be needed. There is lots of light. The extras are much appreciated (soap, paper towel, spices, stocked beach wagon including cooler, etc.). The view of the sea and sunset were very nice, even though not right on the water. The area is one we chose on purpose from previous experience - nearby Cabot Provincial Park (good swimming, beautiful beach, park), Thunder Cove beach (most beautiful beach ever), and the Basinview Seafood market for easy dinners. We checked out the Basin beach one day but was full of seaweed so we didn't actually spend any time (although maybe better at other times). The nearby Twin Shores camping area was actually a plus for us as the General Store is well stocked for any missing items. Eugene was extremely responsive and available with any questions. We will definitely return to this cottage. It really is heart-warming when guests let you know they've had a great time at your property. It's even better when they re-book for a second year. I'm so excited for Chloe and her family when they return in 2018 because the cottage will have had a great makeover by the time they arrive - new interior lighting fixtures, new shingle siding and an open gable porch over the front deck. I sure hope they like the changes! We have been staying at this cottage for 9 years and always enjoy our stay. It is our second home with all the comforts. Small and cosy with an amazing view. The cottage is fully stocked with extra items to make your life more easy. Darnley is truly a stunning area and this cottage is a perfect fit. Highly recommended to have an a great escape, family vacation or some R&R. The entire experience from start to finish was perfect! From start to finish the entire experience couldn't have been better! Eugene was prompt, courteous, kind and helpful in all our exchanges. The cottage was perfectly equipped for an effortless vacation without being crowded and the dunes and the beach were beautiful and a short walk away! PEI is a gorgeous and relaxing land and the cottage was a wonderful home away from home! We felt very lucky to get to enjoy it! So impressed with the quality of the cottage and the comfort. The location is about 45 minutes from the Charlottetown airport but very central to most of the province. We had hot windy weather which made it difficult to enjoy the verandahs but we sure enjoyed the views and the ease to get through the neighbouring campsite to the beach. Enjoy! The Dunes is ideally located close to shops, restaurants, leisure activities, beaches, mountain biking, kayaking, whale watching and deep sea fishing. Great casual and fine dining is only a short drive along the magnificent north shore. The nearby town of Kensington has shopping, service stations, a bank and a medical centre. There is a flea market, haunted mansion, miniature golf, museum and more. Watch the signs for a strawberry or ice cream social or a Ceilidh, island favourites. Of course, the Anne of Green Gables Museum and other Anne attractions are not far away. Some of the island’s most popular world-class golf courses are within a 20-30 minute drive. Rates include all taxes. Rates do not include Cleaning Fee - Cleaning is performed at the end of the visit and applied to the total visit (two weeks, one week, etc.). To be fair to those who rent for more than one week at a time, it is separate from the weekly rental fee.